A wonderful Tag Team dinner evening out at Ruth’s Chris Steak House! Tag UR It! 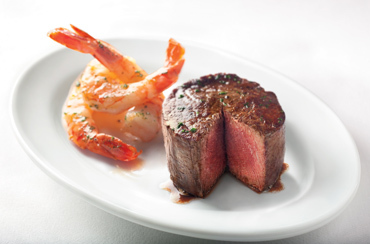 inc. is proud of our business partnership with many Ruth’s Chris Steak House locations nationwide! We have been providing quality name badges and table reserved signs for Steak House locations for the past 3 years. Until this weekend, the Tag Team members had yet to enjoy the wonderful cuisine and atmosphere of Ruth’s Chris together as a group! Saturday night, the Tag Team enjoyed a fabulous meal at the Irvine, CA Ruth’s Chris Steak House. Upon entering, we were welcomed by their wonderful staff! Sam, our waiter, brought us some warm, soft yummy bread and took our order! 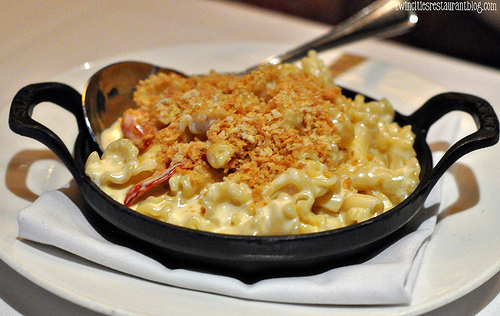 We all chose to go with their pre-fixed menu which offers each guest a starter, entrée, personal side dish, and desert duo. I enjoyed a delicious caesar salad to start, followed by perfectly cooked scallops with lump crab meat! Catheryn’s salmon was just as amazing! Heidi enjoyed the star of Ruth’s Chris Steak House, filet mignon and shrimp! Simply wonderful!! Dessert was actually my favorite part! Each meal came with a desert duo of chocolate strawberry cheesecake and dark chocolate nuts clusters. To die for good! I could eat those little cheesecakes daily!! 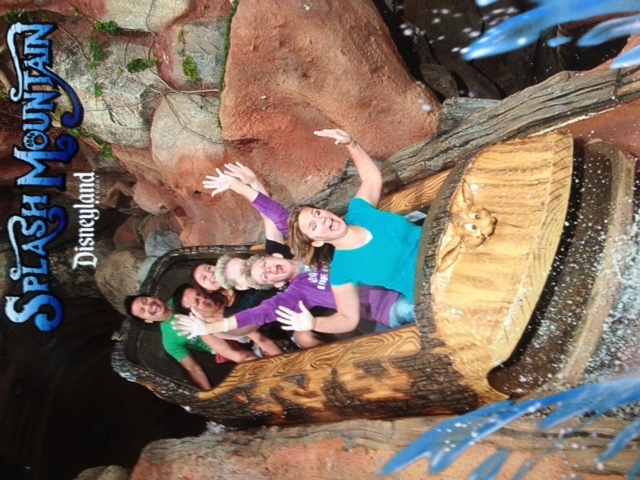 We had a wonderful evening out to dinner and cannot wait to return! Tag UR It! inc. is serving the name tag, recognition award, and custom table reserve sign needs of many Ruth’s Chris Steak House locations nationwide. Here are just a few of the products we are proud to provide! 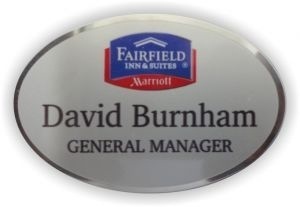 Our 3/4″ x 2 3/4″ black/white plastic engraved name badge is a popular style among Ruth’s Christ Steak House locations. 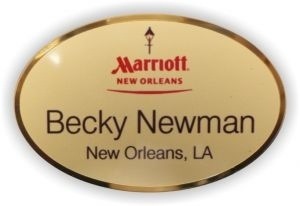 This simply classic name tag is available with pin or magnetic backing. 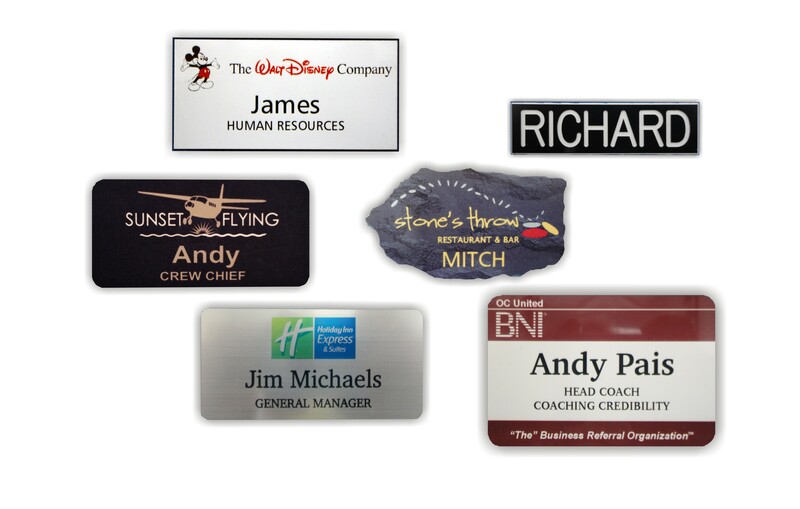 Our 1″ x 3″ Silver Beveled Name Tag with Silver Face is another popular selection. The polished silver edge is complimented perfectly by the brushed silver face. These tags are a great backdrop for any logo! Also available with pin or magnetic backing. Our table top reserved signs are quickly becoming a big hit at Ruth’s Christ Steak House locations nationwide! These solid wood blocks feature a gold sublimated front with full color logo. (Also available in silver!) The back of each block holds a slider frame where name plates can be easily switched out to display the names of frequent restaurant parties. 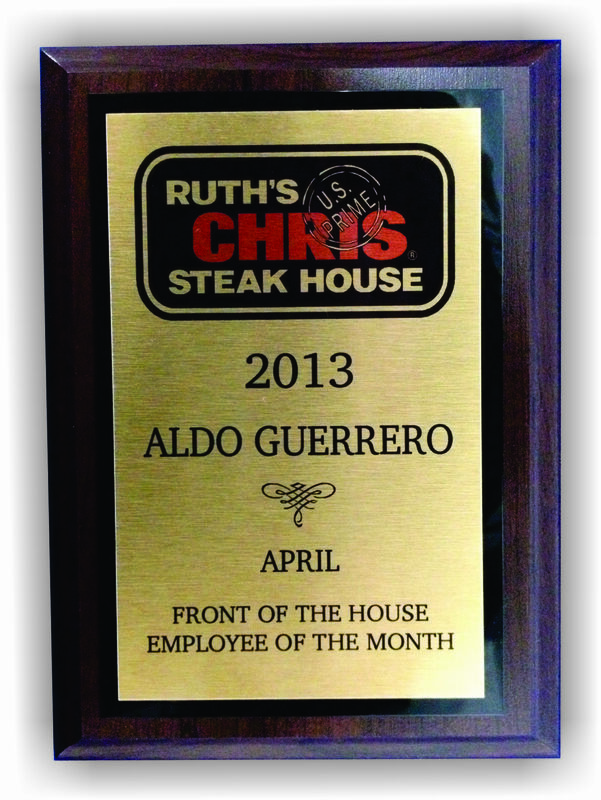 Award Plaques are another popular Ruth’s Chris Steak House order. We offer custom award plaques in an endless variety of sizes and materials. Contact us today to find out more about options for award plaques for your restaurant, hotel, or business today!